Ideally, children should engage in no more than two hours per day of recreational screen time. To help children adhere to this rule, parents need to proactively think about how they’re going to regulate screen time. Small behavior modifications like keeping screens out of the bedroom, away from the dinner table, setting time limits on tablet and video game usage, and unplugging for a day as a family can go a long way in helping kids find activities to do sans technology — exercise being one of them. The American Academy of Pediatrics recommends that children ages six and up get at least one hour of physical activity every day. However, kids don’t have to exercise for an hour straight for it to be effective. For example, the 60 minutes can be broken up into 10 minutes of jump rope, 30 minutes of playing in the park, and 20 minutes of tag or Frisbee or walking. Children under 6 can benefit from seeing their parents model a healthy lifestyle and engage in activities that encourage movement daily. When children don’t get the recommended amount or more of physical activity, it can negatively impact their health. • Be a role model: Kids are more likely to live healthy, active lifestyles if they see their parents playing sports, exercising, or being physically active every day. Children tend to adopt the lifestyle that their parents demonstrate, so it’s important to model healthy habits. • Plan ahead: Don’t only think a day ahead or week in advance, but think about how you plan to regulate activity and screen time throughout childhood. Create rules around screen time early and stick to them. On a day-to-day basis, plan days and times that your children can be active and give them opportunities to do so. 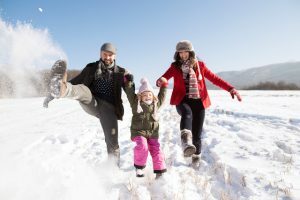 It may seem like there aren’t enough hours in the day to set aside time to be active, but if families make physical activity a priority and plan for it, it can happen. • Find a fun activity to do together and play with your kids: We live in a busy society where many families are constantly running from place to place and often feel pressed for time. Amid the busyness, make exercise a priority and find ways to get your kids excited and interested in participating. The keys to being active and getting kids active are making it fun and making it a priority. Take time to get together as a family to discover what fun activities you enjoy and then schedule one or two of those activities in each week. Soothing tones: Music therapy may help ease anxiety of mothers-to-be Can Group Singing Brighten COPD Blues and Improve Quality of Life?